Showcase phases of moon in an exciting way with this Eclipse Windbell. 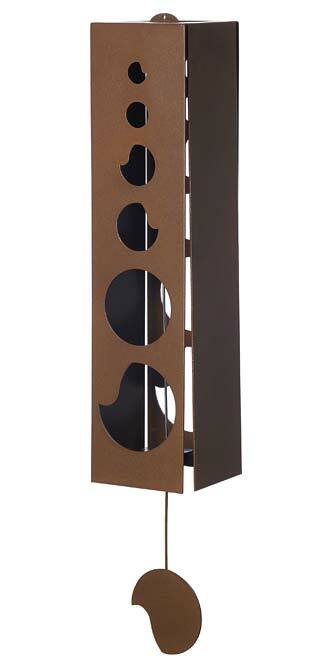 This rectangular bell will certainly lend a modern hint to your landscaping, while providing wonderful background sound. The steel sheet construction forms a hardy piece, and circular cut outs along the body increase in size toward the base, evoking moon phases. A metal disc on the bottom pull matches the shape of the lowest cut out, and the browned copper color throughout the item blends with the natural world. The center, 2" diameter striker provides a clear and resonating sound, and the bell hangs perfectly with its included cable. The powder coated body ensures weather resistance for many seasons, and the square shape furthers the contemporary motif. Enjoy the sound of the wind in your backyard with this Eclipse Windbell.